Closing night at 2006 SFKAFF saw the return of Je-Gyu Kang's Taegukgi: The Brotherhood of War (2004) to the Bay Area after its initial run last Fall. This go around, however, director Je-Gyu Kang introduced the film and fielded questions from his Presidio audience afterwards. 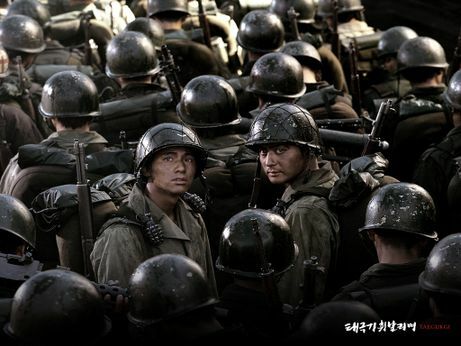 Taegukgi was Korea's official submission to the foreign language category of the 2004 Academy Awards®. As I expressed to Je-Gyu Kang, I found the film a scathing indictment of war as well as a powerful historical corrective. Je-Gyu Kang admitted his pleasure that the film has screened in more than 40 countries. Though markedly different in tone and scale, Taegukgi and Spring in My Hometown (1998) both assert that the Korean war was not a war Koreans really wanted to fight. They were pawns ground up between democratic and communist ideologies. It was, in effect, not really their war even though they killed their own kind and ravished their own country. 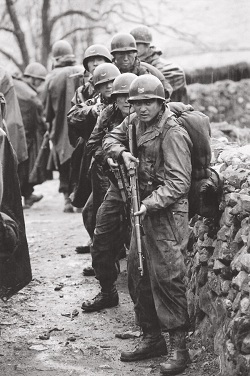 Of course Koreans wanted the war to stop so they could return to their homes and get on with their lives. Whereas Hometown depicted the effect of the war and American presence on Korean family life in a village far removed from battle, Taegukgi marched fearlessly into the trenches, replicating battle carnage to a degree I've rarely seen. Its unflinchingly melodramatic flourishes elevated its characters above the bloody clamor to achieve a heroic stature. The grand, sweeping score by Lee Dong-jun securely manipulated sympathies. Asked whether films like Apocalypse Now or Saving Private Ryan had exerted any kind of pressure or influence upon the kind of war movie he wanted to make, Je-Gyu Kang's asserted his film was different. Its focus was not on any one side winning out over an enemy; but rather, a movie where both sides won out against war. Asked which scenes were the most difficult to shoot, he responded that the multiple battle sequences were filmed in the mountains under severe weather conditions. Further, because they needed so much smoke for the movie, and because their budget would not allow the usual Hollywood price of $50 per smoke canister, Je-Gyu Kang was forced to burn tires, sometimes up to as many as 300 a day. Not only did this deplete the stock of tires in the region but polluted the air so badly that breathing the smoke day in and day out proved problematic for actors and crew. Well into the film an oversized Hershey's chocolate bar is introduced into the narrative as an indication of the arrival of an American military presence in Korea (and its concomitant colonial implications). I asked if the product placement was thematic or commercial? Je-Gyu Kang assured me the Hershey's corporation did not give him the license to use the product, let alone any funding. This scene has been deemed "anachronistic", however, by Sanjuro, reviewer for Love HK Films.com who observed that "companies weren't required to list the 'Nutrition Facts' until the 1990s." 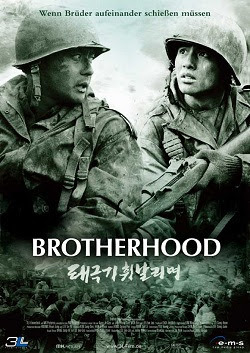 Both lead actors—Jang Dong-gun as the older brother and Won Bin as the younger—successfully carry the weight of the film to its anticipated denouement where brother is pit against brother in the hellish confusion of battle. Won Bin especially conveys a vast array of emotions in contrast to his stern, steel-faced brother. Whereas Won Bin cries frequently thoughout the film, Jang Dong-gun cries but once. Of related interest: Darcy Paquet provides background at the Korean Film Page.